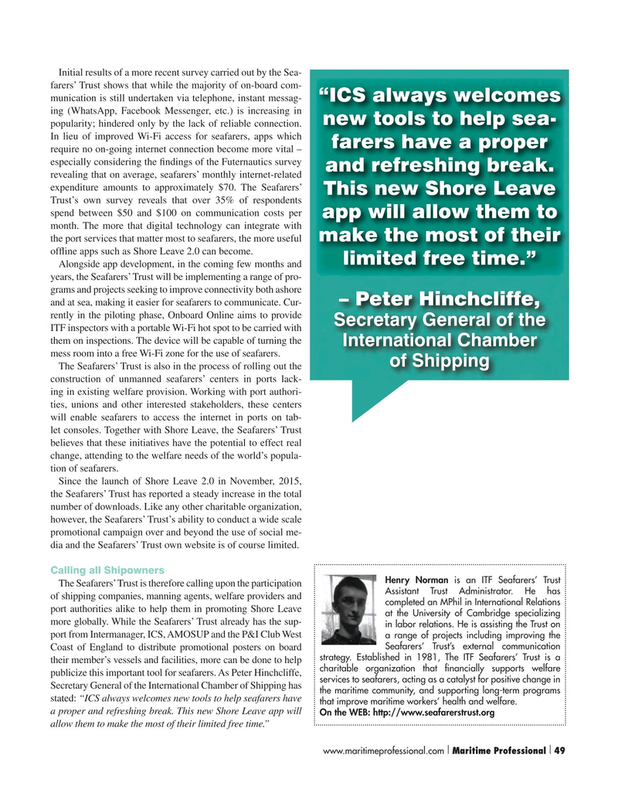 Initial results of a more recent survey carried out by the Sea- farers’ Trust shows that while the majority of on-board com- munication is still undertaken via telephone, instant messag- “ICS always welcomes ing (WhatsApp, Facebook Messenger, etc.) is increasing in new tools to help sea- popularity; hindered only by the lack of reliable connection. International Chamber mess room into a free Wi-Fi zone for the use of seafarers. The Seafarers’ Trust is also in the process of rolling out the construction of unmanned seafarers’ centers in ports lack- ing in existing welfare provision. Working with port authori- ties, unions and other interested stakeholders, these centers will enable seafarers to access the internet in ports on tab- let consoles. Together with Shore Leave, the Seafarers’ Trust believes that these initiatives have the potential to effect real change, attending to the welfare needs of the world’s popula- tion of seafarers. Since the launch of Shore Leave 2.0 in November, 2015, the Seafarers’ Trust has reported a steady increase in the total number of downloads. Like any other charitable organization, however, the Seafarers’ Trust’s ability to conduct a wide scale promotional campaign over and beyond the use of social me- dia and the Seafarers’ Trust own website is of course limited.